The interplay of music and identity, in particular with regards to Nazi cultural policy in Austria’s province Tyrol, is one of Bernhard Achhorner’s research interests. Mr Achhorner obtained his degree from the University of Innsbruck and was a recent research fellow at the “Center Austria: The Austrian Marshall Plan Center for European Studies” of the University of New Orleans. As a musicology and anthropology student, he investigated the intersection between music and identity, music and politics, as well as intermediality and performance studies. Within the framework of our commemorative series of several historical events this year, including Austria’s annexation to the Third Reich 80 years ago, we are featuring an interview on Mr Achhorner’s research, asking about the special role of music in propaganda generally and during the Nazi regime specifically, his views on Austrian folk music today and his take on commemorating these historical events. You will be able to hear him in person during his lecture about Music as a Strategy of Cultural Policy in Nazi Germany, which he will hold at the ACF Washington on September 5th. From your research on the influence of music as a strategy for cultural policy in the NS times, what was for you the most striking, unexpected result of what impact music can have for propaganda purposes? Is there a big difference compared to images and photographs, also extensively used for propaganda? 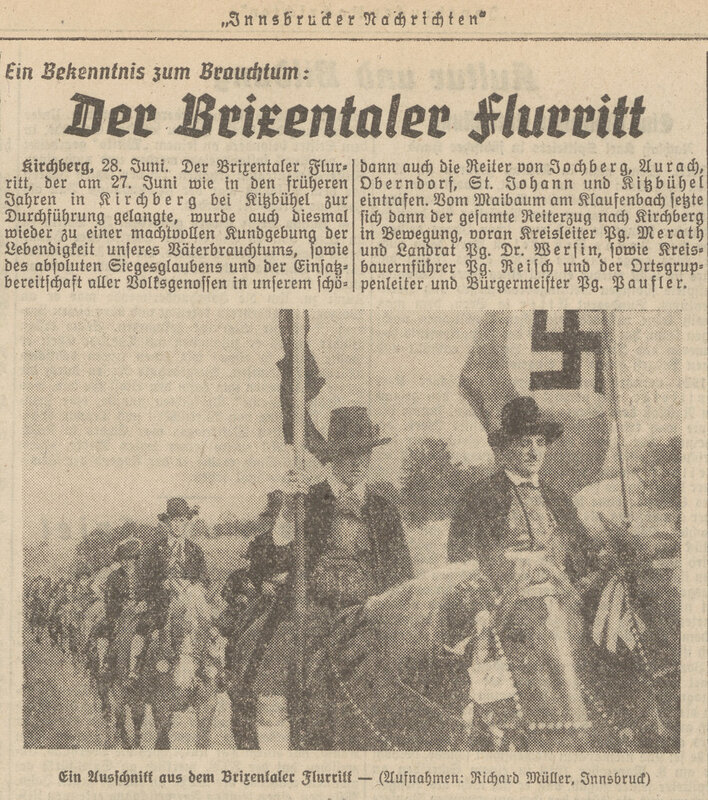 What made the greatest impression on me was how National Socialist cultural and identity policy was able to exploit an archive of commonly inhabited history for the purpose of creating a sense of national belonging and national identity. By reinterpreting mythical, primordial texts that are foundational for the identity of a community, by leaving out facts in the biographies of local heroes – like, for example, the strict Catholicism of Andreas Hofer or the Communist aspects in the thinking of Michael Gaismairs – and also emphasizing local rootedness and nativity, as well as by conveying a romantic notion of rural life, it was possible to make culture and the state coincide and to propagate their unity as a naturalistic and biologistic construct. Concretely, this means that an attempt was made systematically to conceal the cultural hybridity that has always already existed. For culture cannot be regarded as a self-enclosed, fixed structure, but rather has constantly to be thought as fluid and permeable. Culture is a process and comes into being in continuous exchange with other cultures. But in National Socialism and, especially, in the Reichsgau Tyrol-Vorarlberg, an image was conveyed that depicted cultural aspects – like, for example, a supposedly special talent for making music, but also precisely character traits like defiance and combativeness – as something that it is written into the DNA of Tyroleans. This led, among other things, to a strong idealization of so-called Volkskultur – literally, “popular culture,” but with a pronounced ethnic connotation that is absent from the English expression – and of custom. One could perhaps affirm that many composers were only eager to further their careers and submitted to National Socialist blood-and-soil politics for this reason. This would, however, be an erroneous conclusion, since many of them proclaimed their allegiance to the Greater German Reich, to the Führer and to the National Socialist party already in the period immediately preceding the Anschluss. Thus, for me, perhaps one of the most surprising discoveries was that many composers were able to identify with the racist and chauvinist ideology and hence were not only fellow travelers, but convinced National Socialists. On the difference between music and image as tools of propaganda, the following can perhaps be said. Music as an emotive medium, with its potential to express emotions and to trigger them among listeners, is, of course, extremely well-suited for the dramaturgy of the National Socialist culture of popular festivals and celebrations, which was manifest in mass marches and rallies. Music played a key role in this culture as bearer of ideological contents. The singing together of songs with mostly war-mongering and anti-Semitic lyrics, as well as marching in rhythm with the music, are, of course, predestined for awakening a sense of belonging. In contrast, propaganda by way of images and photographs functions perhaps on a more subtle level, whose content and message are conveyed via other channels. Do you think the importance of music for this kind of strategy was particular for the Nazi regime or could your findings also be applied more generally to other totalitarian regimes from different areas of the world? 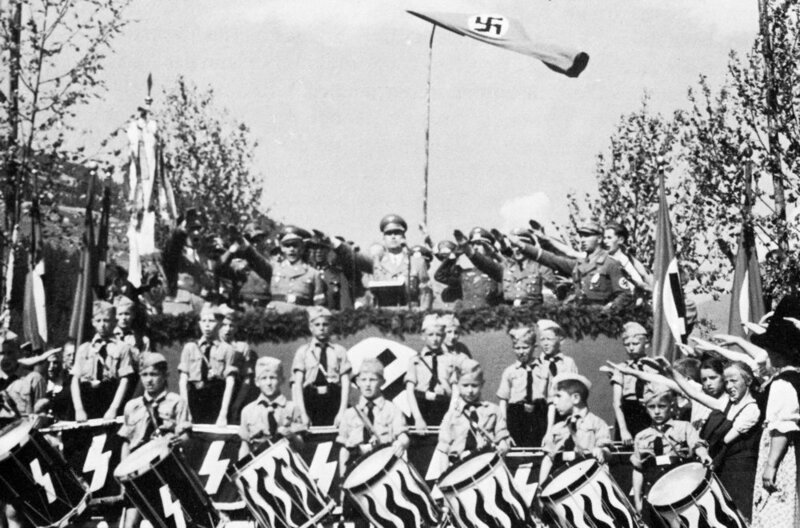 I think that, above all, the way in which music was used as a tool of propaganda in the National Socialist period in Tyrol can be described as unique. 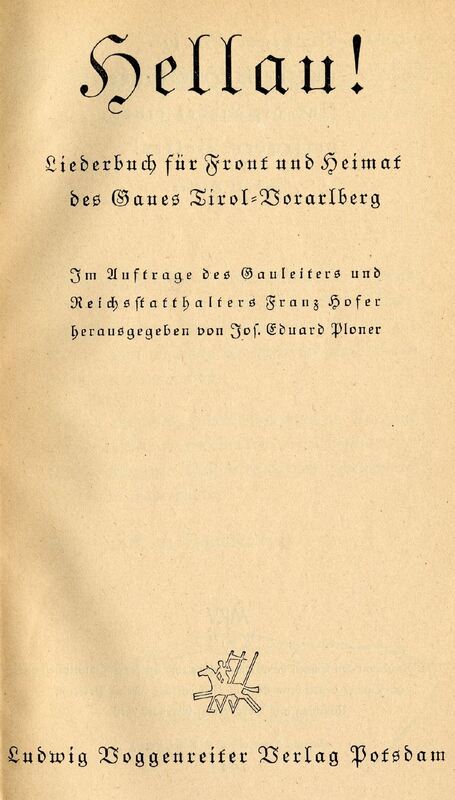 The systematic restructuring of the Standschützenverband (a kind of popular volunteer defense force) into a key institution for all cultural affairs and events, which the marching bands had also to join, and the publication of a Reichsgau song book, comprising traditional Tyrolean songs, songs of the youth movement and anti-Semitic songs, undoubtedly represent a particularly pronounced form of musical propaganda for the purpose of consolidating an identity. But there are, of course, also parallels to other totalitarian forms of government around the world. All movements of national reawakening made use of art and culture, in order to attain their cultural-political and also bio-political goals. In large measure, what is at issue here is creating or even imposing possibilities of identification. Precisely in the second half of the 19th century, more and more efforts have been made to develop explicitly national musical styles. Especially in Austria today, traditional music, the so-called “Volksmusik”, is often being associated with a certain political ideology and thus, following-up on your research, might allow an interpretation that it never fully escaped from its propaganda use in the NS time. What do you think about that? What would be necessary to bring all these concepts and cultural expressions that are linked in Austria to the ideas of “Heimat”, patriotism, folklore and traditional cultures into a more modern, light and neutral understanding? Yes, I also fundamentally agree with this view. Popular Volksmusik and traditional brass bands are still today associated by some people with certain political sentiments and a certain past. This is partly justified, I find. For defensiveness, whitewashing biographies and preventing access to archives cannot be the goal of a sustainable efforts at elucidation – this is also the case for the next generation of musicians of the said institutions themselves. Instead, a clear commitment to seamlessly examining their implication in the cultural-political agenda of the National Socialist period could provide a strong signal. Freeing such music from general suspicion can only happen, namely, if this dark chapter in the history of Austrian popular culture is transparently and openly discussed. In this whole matter, however, it should also not be forgotten that it was not only Volksmusik that was instrumentalized for the purposes of propaganda: classical music was also composed with the corresponding ideological contents or tinted by National Socialist conceptions. Music historian Kurt Drexel, for instance, points to the fact that Beethoven’s Ninth was used in the Third Reich on official occasions and today is the European Anthem. On the other hand, however, it should also be noted that precisely “avant-garde” currents in Volksmusik and brass band music are assuming ever greater significance in the Austrian musical landscape – especially in recent decades. This applies to “authentic” Volksmusik, but also to other genres in which so-called crossover elements are experimented with. Most of the musicians in these groups have a university degree in music, but were socialized in the local Volksmusik and brass band tradition. Making “back to the roots” their motto, they try to reinterpret their musical roots with technical precision or with jazz elements or to compose new innovative pieces for a variety of ensembles. In 2018 Austria commemorates 80-years of the so-called “Anschluss” to the Nazi-regime in 1938, one of the reasons why we also invited you to give this lecture at the Austrian Embassy. What is your impression of the activities of this commemoration so far, do you think it helps keeping the memory alive? I think that the 21st century society is right now in a period of transition. A transition from living remembrance in organic memory to remembrance that is, for the most part, materialized in cultural objectifications. A transition that results in memories of one of the cruelest periods since humanity’s very beginnings being only still accessible in the form of documents or gaining expression in monuments. Precisely because the generation of eyewitnesses, who remind us of the events of the National Socialist period on a daily basis, is slowly passing away, these sorts of events dedicated to a culture of remembrance cannot be given enough importance. This is the only way to assure that the past is constantly made contemporary and retained in the present, such that the atrocities of World War II are not forgotten. The events at the ACF Washington, at the Austrian Embassies around the world as well as in Austria itself are making a significant contribution. Finally, a personal question: the combination of musicology and anthropology is a rather rare one, how did you develop your specialty, how did you get interested in these topics? What are your plans for the future? I perhaps should clarify something in this connection. Thus, the addition “cultural” should in fact be placed before the term “anthropology.” In the German-speaking countries, cultural anthropology is one of the possible designations for the discipline that was formerly known as Volkskunde and that was heavily implicated in National Socialist agendas. The renaming occurred following the efforts to come to terms with the role of the discipline in the National Socialist period. The second common designation would be “European Ethnology.” The discipline predominantly deals with the past and present of manifestations of everyday and popular culture. Since also in the context of musicology, I was already always particularly fascinated by the sub-area of musical ethnology and dealing with other musical cultures, specializing in cultural studies approaches to the study of musical phenomena was a logical step. The connections of music and identity and of music and politics are of central importance for me here. In the future, I hope to be able to expand further into the area of musicology.